For any cultural tourist visiting South India for the first time, there are a few indigenous dance forms that would surely capture his/her imagination, due to their uniqueness of character, conceptualisation and execution. The elaborate and colourful costumes and extensive make-up add to their wide acceptance and popularity. Kathakali is one such dance form. It is one of the two Classical Dance forms of Kerala - the other being Mohiniyattam; Kuchipudi and Bharatanatyam are the other Classical Dance forms of South India. As you touch down in Kerala, God’s Own Country, you are sure to witness an expanse of green foliage, lines of coconut trees, ripples of rain drops on slushy grounds, men and women dressed in pristine white clothes and beautiful backwaters - which stretch through most of the State. Kerala is also a cultural oasis, and boasts of almost fifty dance forms. 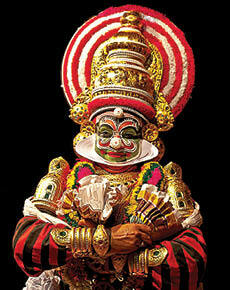 The origins of Kathakali can be traced to the reign of Manavedan of Calicut (17th. Century), who inspired the creation of Krishnattam; his rival, Kottarakkara Thampuran, created the Ramanattam and introduced Sanskritised verses in Malayalam. The Aattakatha (Dance Story) was a new style that evolved from these variations, and it later came to be known as Kathakali. Kathakali has been influenced by Koodiyattam and Chakiarkoothu as well. Kathakali is a dance tale, based on stories from Hindu mythology. It is a dance that is distinguished by its deft movements, highly evolved gestures, colourful and intricate skirt-like costumes and, above all, make-up that involves extensive face-painting (comparable to the performing arts in many countries of South-East Asia). The use of make-up in Kathakali is so elaborate that the face of the dancer resembles a brightly coloured mask – with appropriate facial structures being highlighted. Each colour attributes different qualities. Green symbolises virtue, piousness and nobility; Red make-up with a red beard portrays evil; Green with Red symbolises evil in a person of royal or high birth. Women characters are normally made up with yellow face paint. The Kathakali make-up is generally prepared from a mixture of rice paste and lime. Make-up in Kathakali is classified as Pachcha, Kathi, Kari, Thaadi, Minukku…each of them signifying a particular depth, colour and texture. The costumes in Kathakali are also extensive and the huge headgear – Kirita – is most impressive (Lords Rama and Krishna wear crowns adorned by peacock feathers). Abhinaya (expression) is a salient feature of Kathakali. The Dance has also borrowed pure elements from some folk forms of Kerala - like Theyyam and Padayani. During the early days, Kathakali performances - illustrating the beauty of choreography - would start at dusk and continue till the wee hours of the morning. Traditionally, 101 stories are staged during a Kathakali performance. The most popular Kathakali stories are the Duryodhana Vadham, Karnashapatham and Keechakavadham. Often the performers depicting the evil Kamsa or Ravana are more appreciated, due to their ability to appropriately ‘exaggerate’ their emotions. The acrobatic jumps and leaps in the dance sequences are called Kalasams. In Kathakali, every part of the body, especially the facial muscles, is tweaked. The eyeballs, eyelids, eyebrows and fingers are manipulated skillfully – with each muscular movement illustrating distinguishing characteristics. A Kathakali performance begins with kelikottu (amusement), followed by todayam (devotional song), purappadu (pure dance) and tiranokku (first entry of principal characters). Another important highlight of a Kathakali performance is the lighting of a huge oil lamp, called the Kalivilakku (lamp of dance), under which the Kathakali performances are commenced. Kathakali demands extensive practice - as many as ten years are needed to master its rigorous nuances. The quick and vigorous movements, which call for excellent hand-eye co-ordination, and the supreme control of eye and facial movements, are only acquired through untiring efforts. There are 24 hand gestures used in Kathakali. Unlike other Classical Dances, in Kathakali the dancer does not need to lip-sync. As the music plays, the dancer emotes only through expressions. The musical instruments (vadhya) used in Kathakali are drums (the Chenda and Maddalam) and a percussion instrument (Ela Taalam). The lead singer is called a Ponnani, while the accompanying singer is referred to as Singidi. A gong (Chengila) and cymbals (Ilathalam) supplement the melodious voice of the Ponnani. With his beautiful, elaborate costume swinging in the air, the expressive dancer, with his face painted in fiery colours, can mesmerise you. The energy and subtleness in each of the movements is indeed matchless. Kathakali, the dance tale, is a display of mastery in motion. Of late, Kathakali choreographers have tried to marry the mythological themes to a ‘western’ context, to attract a wider audience. Kathakali dance is true to the salient concept - the three Ns - of Classical Dance: Nritta (dance movements in rhythm), Nritya (depicting a story through facial and body movements) and Natya (the sum-total of the intricacies of Nritta and Nritya).